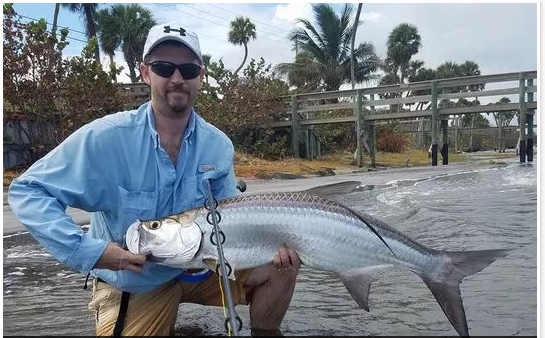 Though the water releases from Lake Okeechobee have had many anglers reluctant to fish in the St. Lucie and Indian Rivers there is some good fishing. North of the Jensen Beach causeway and up the Indian River towards the power plant there is much cleaner water. In those areas, there are decent schools of mullet and plenty of big jack crevalle slamming them. Best bets for those jacks has been using shiny top water plugs and working the fringes of the bait schools. 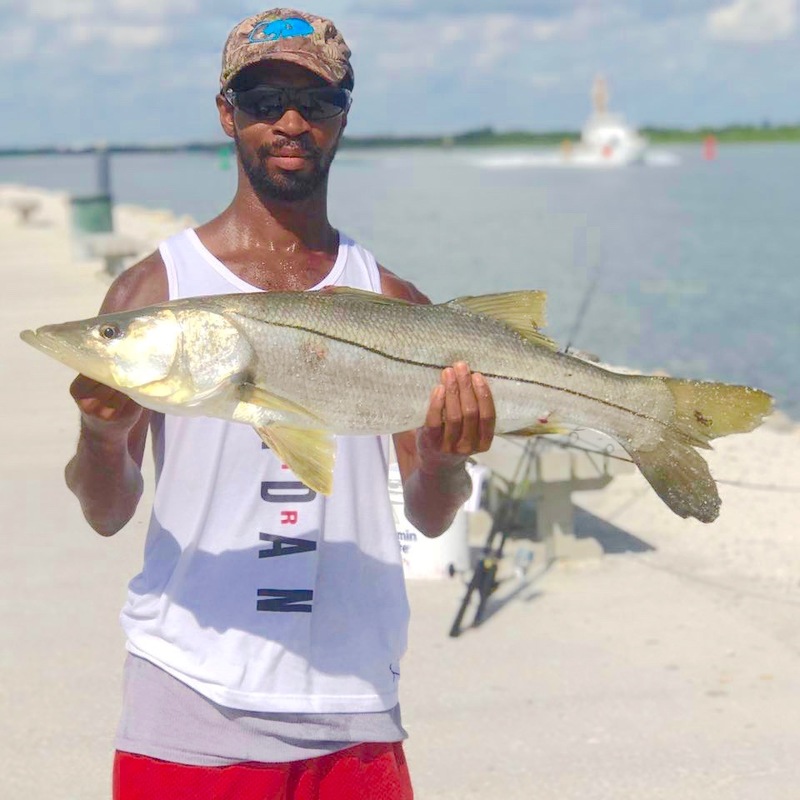 In the Loxahatchee River, anglers are reporting an excellent snook and tarpon bite. They are having good luck using live mullet or any artificial bait that resembles mullet. Fishing the Jupiter Inlet has been good for snook and some redfish using finger mullet. Though the surf has been rough, there has been plenty of bait moving along the beaches from South Palm Beach to Delray Beach. 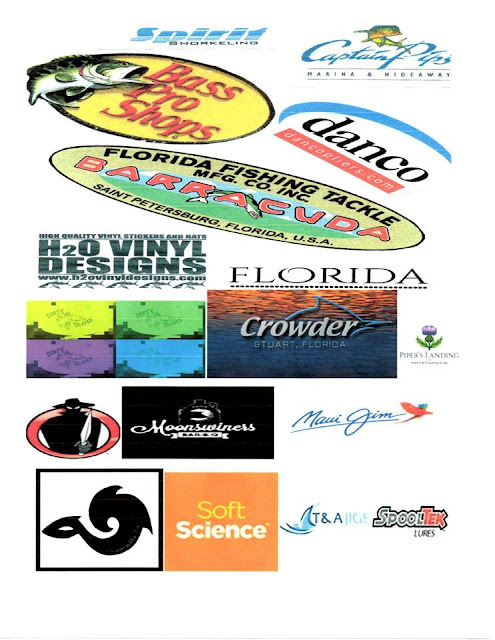 Anglers there are catching tarpon, snook, barracuda, Spanish mackerel, pompano, mutton snapper and small sharks. At the Boynton Inlet, anglers are catching snook, tarpon, snapper, redfish, Spanish mackerel and. The fish have been hitting both live and dead bait as well as lures and jigs. RedTail Hawks jigs have been deadly at night on the outgoing tide for snook. Anglers in the Intracoastal Waterway are having good luck around the docks using live finger mullet, Cotee jigs and top water plugs to catch redfish, snook, tarpon, barracuda and small tripletail. Snook, tarpon, jacks and a few redfish have been caught around the Lantana Bridge. Though the water level is up and the water a bit dirty from all the rain from Hurricane Irma, the fishing has been excellent. Live shiners have been the go-to bait for many anglers, but artificial is also working well. Winds are blowing out of the North-northwest at 8 mph, gusting to 9 and there is a moderate chop on the water. There are clouds over the inlet and we have a slight chance of showers after 2:00 p.m. We have high seas and NOAA has issued a small craft advisory for seas through Wednesday morning. The mullet run is in full force at the inlet and that is bringing in the big predators. Snook are being landed all over the State Park including the T-Dock, beaches, river bank, rocks and jetties. Big Reds are back and some are in the slot but a lot have been huge and returned to the water. The slot for Reds is 18" - 27" and the bag limit is one per person per day. The slot for Snook is 28" - 32" and one per person per day. Please abide by the FWC regulations, our resources are not unlimited. 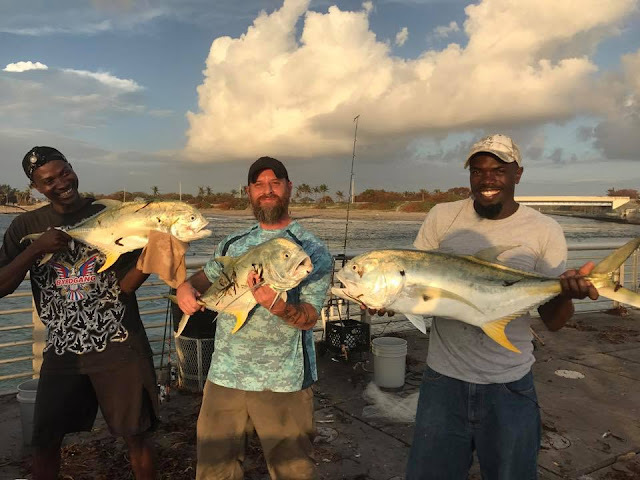 Big Jacks, a occasional Permit or other tasty catch will find its way to our inlet anglers. Mike Ricciardi fished the north jetty on Friday and reported the Snook bite was fair, only one slot Snook was landed during the morning hours but Reds were a different story. They were chasing mullet and biting well. Jacks in the 1 - 10 lb. range were being landed as well. Thanks Mike! Our angler of the day is Matt Badolato. Matt fished the inlet in his 16' skiff; shortly after Hurricane Irma came through. Matt reported a very strong tide probably from the high water levels in the IRL and Sebastian Rivers. The inlet water was so fresh that while netting mullet for bait he also got a fresh water shad in the mix! Matt landed this beautiful 26" Cubera Snapper with one of the mullet. SpoolTek lures are one of the newest and most innovative swim baits on the market and can be used to target a multitude of predatory game fish species. The SpoolTek comes equipped with a wheel shaped mechanism that retrieves your wire leader after it is deployed between fish. When you purchase one bait it also comes with one extra removable tail in the package. The SpoolTek is offered in 3 different sizes and a variation of color combos. 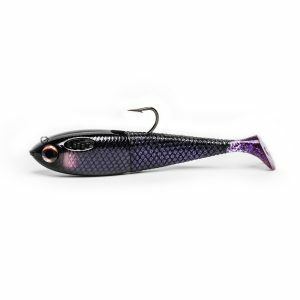 the three sizes are 4 inch fatty 6 inch fatty and the 9 inch stretch each size bait can be used in many different applications and work very well. My favorite SpoolTek is the 6″ Fatty in AYU and Great Sardini. A unique feature that SpoolTeck lures offers is each bait has an internal wire that deploys with your hookset allowing you to keep fish hooked which greatly reduces shake offs and thrown hooks by taking the extra weight way from the hook and the hole in the fishes mouth. Since the wire is much more abrasion resistant than the traditional monofilament and fluorocarbon leader materials, the wire cable can help you pull fish out of heavy structures. The concealed wire leader also allows you to down size your leader when certain fish are finicky and leader shy. Personally I have caught many large game fish species such as, Snook over 25 pounds and Tarpon over 100 pounds all on the same bait. From my experience the Spooltek is on my top three baits for targeting big fish and you can always find one tied on at least one of my rods in the arsenal. All in all, this a great and productive bait that not only produces numbers of fish but produces big fish, so tie on a SpoolTek you will not regret it! As Hurricane Marie continues to move in a northerly direction the effects of the swells, rain, and grass and weed accumulation along our local beaches will gradually diminish. I took a ride Sunday along A1A on Hutchinson Island and looked at 14 beach accesses to see what kind of conditions we presently have. Last week after Irma we had a number of spots that had big drop down accesses that were in the 4 to 6 foot range. I am happy to report that only a couple of beaches still have those conditions, but have shrunk to 2 to 4 feet. Unfortunately, a lot of our beaches in Martin and St Lucie counties have lost tons of sand and the size of the beaches have been greatly reduced. Below you will find a number of individual beach conditions and going forward, I will continue to update as they change. As far as fishing goes, I am hoping with the wind shift predictions of the upcoming week and the last swells of Marie going away, we can start concentrating on the schools of mullet and the predators that are chasing them as they continue their southerly migration. The grass and weed mats may be the most challenging factor while throwing lures and live bait to the tarpon, jacks, ladyfish, snook, bluefish, and mackerel that will be in pursuit of all of this bait. Things will get back to normal and patience may be the key word we will be concentrating on. It is going to be some time before reminders like the two beached boats I observed on the beaches today are out of sight but in time all we will be talking about bending a rod and having fun. The Keys are making a strong comeback, as is the west coast of Florida but keep all of our friends in Puerto Rico and the island chains that were devastated in your thoughts and prayers. Good luck this week and catch em up. The following beach accesses are now accessible : Santa Lucea, Stuart Public Beach, Tiger Shores, Virginia Forrest, Bryn Mawr, Bob Graham, County Line, Hermans Bay, Walton Rocks, and Middle Cove. The two spots that still have a 2 to 3 foot drop down are Dollmans Beachside and Normandy. Almost all of these spots have mountains of grass and weeds and it will take some time before they get back to pre-storm conditions. Out of all of the areas listed above, Middle Cove looks to be in the best shape and if conditions improve this week to the point where I can fish again, that will be the spot I will start with. Inshore the mullet have been around the spoil islands and the bridges with snook,trout, and reds in them find the bait and you will find some fish. The jetty has been good with a few tarpon and snook at night with jigs on the outgoing tide. Fishing With Jupiter George......MY BIGGEST JIG FISH EVER!!! Surf fishing continues to be very challenging due to the swells from Jose and moving forward, we will experience the same conditions from Maria as she moves on the predicted northerly path well to the east of us this weekend. We should be thankful that this is the only effects we are going to experience from this storm. Our thoughts and prayers go out to the island communities that took the brunt of this major storm and after watching reports of the battering that Puerto Rico took we are very lucky. Dirty water and high surf conditions are something we can deal with. I spent some time yesterday checking out local beaches and found fishing conditions to be very difficult. Middle Cove, Herman’s Bay, Tiger Shores, and Bridge Road in Hobe Sound all had big surf and brown water. My son and I ended up fishing on the dock at Twin Rivers Park in Port Salerno and had some fun catching jacks, catfish, and a 20-pound ray. Fishbites, cut shrimp, and live finger mullet all produced the bites. When we first got there pods of tarpon could be seen hammering the mullet schools that were south of us at that location. I plan on being there at an earlier time today, Thursday, and hopefully get a couple of bites from those fish. 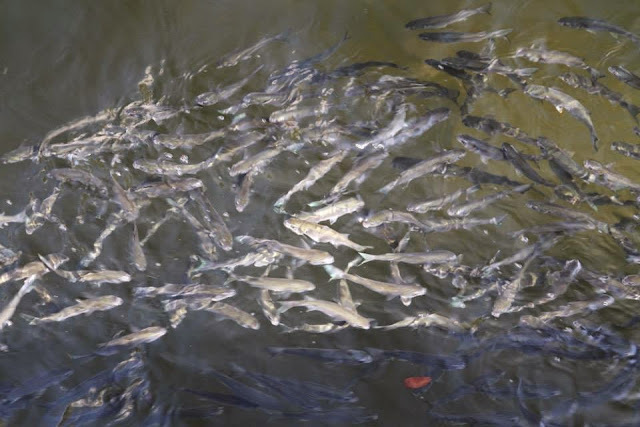 The river has plenty of mullet moving along our shores and jacks, snook, and tarpon will all be in pursuit of this bait as they continue moving into our area. 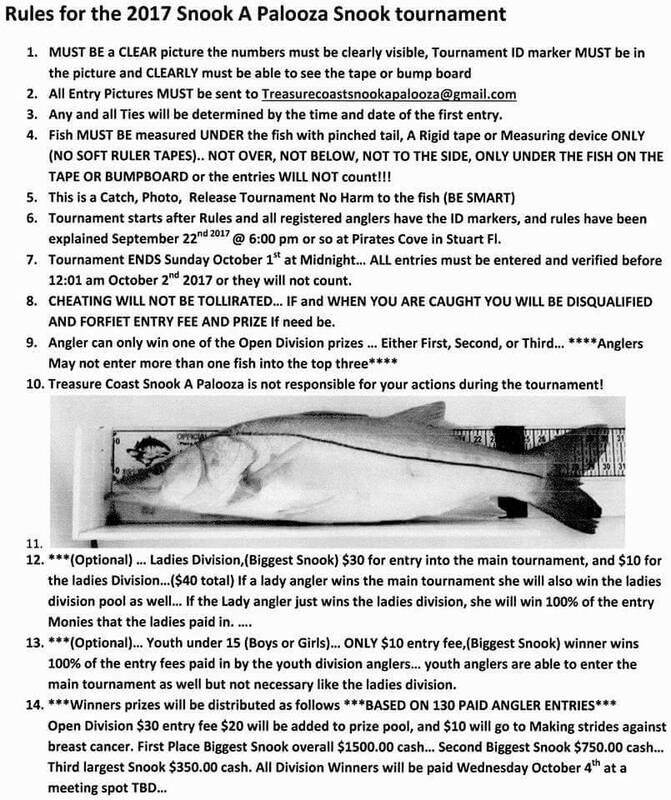 I wanted to remind everyone that the popular Snook-A-Palooza fishing tournament kicks off with registration and the Captains Meeting Friday night at Pirates Cove Marina in Stuart at 6:30 pm. 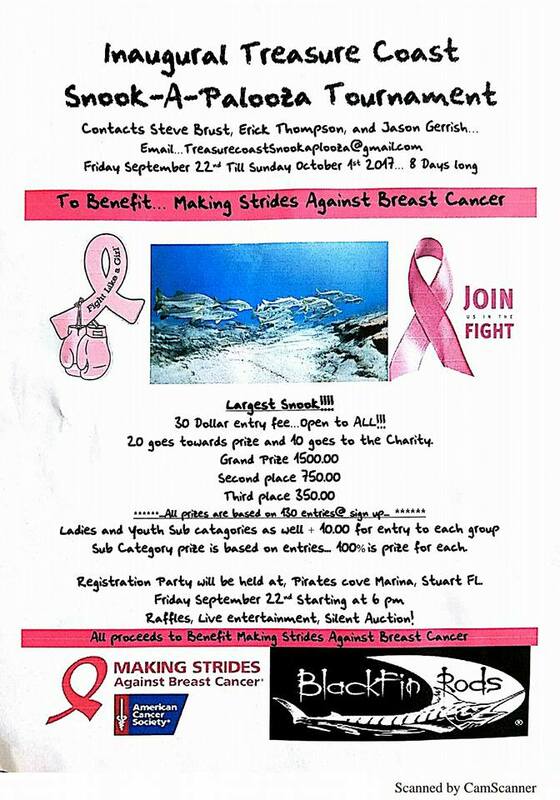 This tournament contributes to a great cause, Making Strides against Breast Cancer, so let’s get out and support it. I will also be in the studio at WSTU 1450 am from 6 to 7 pm with local fishing expert and owner of the Snook Nook, Fred Ciamotto, reporting on species, tackle, techniques, and locations to target your local fishing efforts this weekend. In the Jensen area, the key to fishing the beaches right is to find the ones that are accessible. The heavy surf caused by Irma and the large swells generated by Jose have left many beaches with large dropoffs of 4 to 6 feet. Several beaches that have been reported as accessible for fishing include Tiger Shores, Herman’s Bay, Middle Cove, Santa Lucia and Stuart Public. In the Intracoastal Waterway, the fall snook season is definitely happening. Bridge anglers are catching their fair share using jigs and throwing plugs. If going with a jig, ¾ or 1 ounce should be sufficient as there isn’t a hard wind to contend with. If using a plug, MirrOlure’s Dog and Rapala Skitter Walk are working well. Bridge fisherman are reporting a good number of tarpon rolling and that they are hitting on plugs and live mullet. Up towards Fort Pierce, anglers fishing the flats near Middle Cove are reporting good action on snook and trout. They are having good luck throwing LIVETARGET Mullet Swimbait lures and also using live bait. 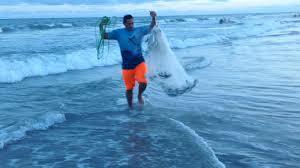 On the beaches in the Boynton area, anglers are catching snook, tarpon, small kingfish and some Spanish mackerel. Live mullet are working well, but artificial lures that look like mullet, including Zara Spooks Silver Mullet and LIVETARGET Mullet Swimbait, are also producing excellent results. Lantana Bridge anglers are reporting catching plenty of jack crevalle, snook and tarpon using finger mullet for bait. With the recent rainfall from Hurricane Irma the lake level has come up considerably. This water rise has caused the bass to become a bit more scattered. They are still there, but it’s a bit more challenging. Right now live shiners are working better than artificial baits. When anglers have located the gamefish, however, artificial baits including spinnerbaits are working. The elevated water level has pushed most of the bluegill up into the canals. Just a quick note about Thursdays fishing . The surf continues to be difficult to fish due to big waves, dirty water, and weeds. We looked at Middle Cove, Hermans Bay, Tiger Shores, and Santa Lucea and those locations all had the above conditions. Thats the bad news. The good news is if you target this weekends efforts to some of our river access locations your chances of hooking some nice fish are excellent. We fished at Twin Rivers Park again yesterday and jumped and hooked a couple of 40 pound tarpon and caught and released some undersized snook. All of our bites were on live mullet and the incoming tide proved to be the successful time. Find the mullet and you will find the fish, its that simple. As Maria moves north look for the swells to keep building along our local beaches so concentrate your efforts on our numerous river spots and the snook, tarpon, and jacks will definitely provide some action. 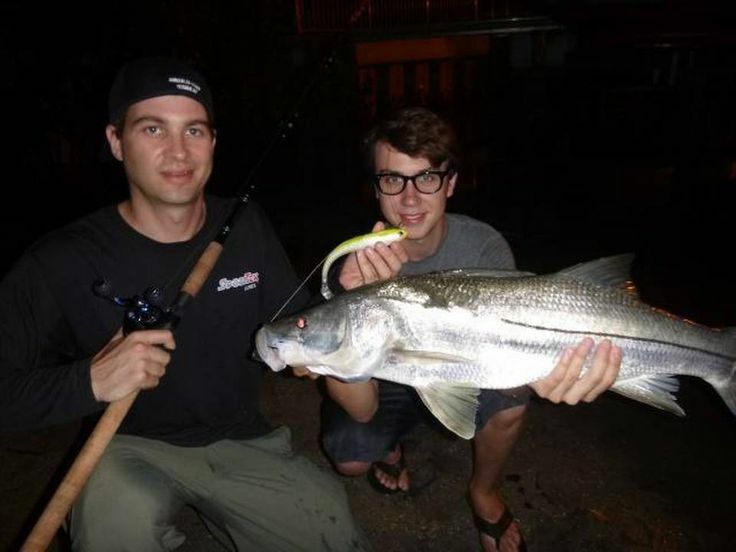 Inshore the snook bite has been great in Stuart with some nice fish around the inlet on bait schools and the bridges at night. The jetty in Ft. pierce has been hit or miss but there is a few fish around. The water to the north still a mess with all the water runoff but there is some reds and snook around the bait schools find the bait and you will find the fish. Due to Hurricane Irma, the north jetty is closed until further notice. 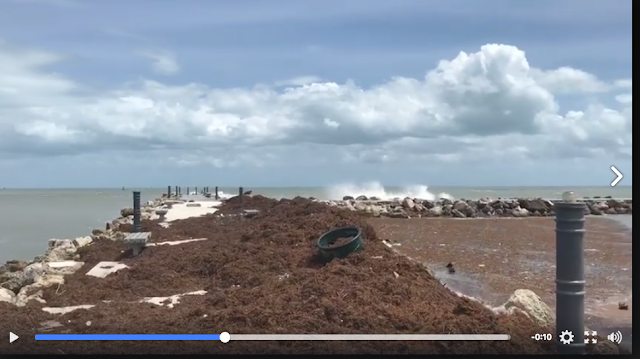 The north side of the Sebastian Inlet State Park is open 24 hours but the south side is closed. Hurricane Irma has come and gone from Florida leaving death and destruction in her wake. Its hard to fathom the extent of damage that has occurred in the Caribbean and most of the Southeastern states. Our hearts go out to those most affected by this tragedy. Please take a moment and donate to one of the many agencies that are providing aid to those in need, like the Red Cross. Our families and friends were fortunate with some damages, but we have our health, homes and loved ones. Please help those who weren't so fortunate! It will be a few days before it will be safe on the water. When you do venture out, watch for debris from trees, docks and other things floating or under water. Many of the ramps are unusable and dangerous. Be careful! Look for snapper around docks, channel edges and bridges. Tarpon should be along the beaches and inlets. 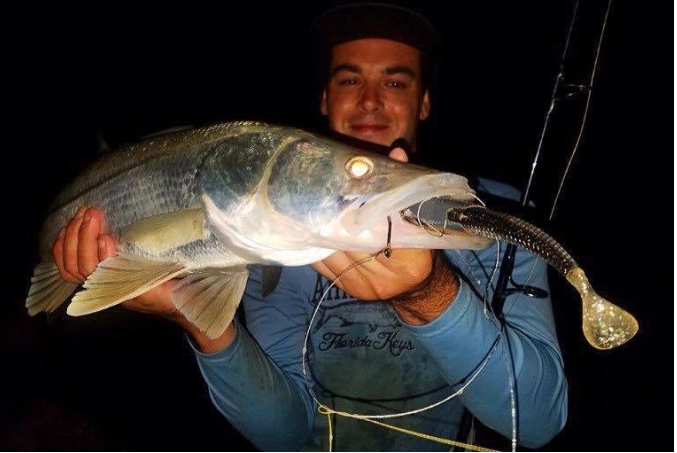 Try for snook around the jetties, bridges and docks of the river. Look for cleaner water when trout fishing on the grass flats. Try Harbor Branch, Queen's Cove or Bear Point. The DOA Deadly Combo is the perfect way to look for trout on the flats. September is a great month to fish on the Treasure Coast. As soon as the water calms down and clears up, get out and enjoy the fishing! Sorry for the delay in posting the beach conditions but I had a minor computer problem last night. I spent about three hours yesterday checking out 14 of our local beaches and here are the results. Some of the accesses have steep drop downs of 5 to 6 feet and the ability to get you, family members, friends ,and your gear to a fishing area safely are going to be compromised. There are enough spots where the path to the beach has a gradual decline so if you are going to fish try these. Walton Rocks and John Brooks beaches are still closed with the gates locked.The areas with the big drop downs of 5 to 6 feet are Blue Heron, Normandy, Dollmans Beachside, Bob Graham, and Virginia Forrest. The fishable beaches are Middle Cove, Hermans Bay, County Line, Bryn Mawr, Tiger Shores, Stuart Beach, and Santa Lucea. The troughs and near shore channels have changed on many of the beaches but if you are going to head out in the near future my top four spots to try would be Tiger Shores, Stuart, Middle Cove, and Santa Lucea. These beach conditions will be changing on a daily basis due to wind, current, and tides but this should give you a good starting point. On a good note the mullet were getting pounded yesterday at Middle Cove but unfortunately they were out of casting range. As far as inshore and offshore troughs, I will be discussing them in further length at the seminar on Saturday at 3:30. 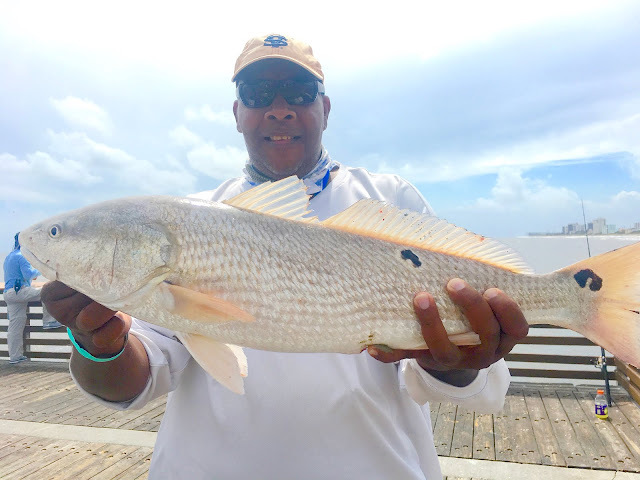 The water color is still dirty and the first species that should be biting will be the croaker for that type of fishing and as the water quality improves the whiting and pompano will follow suit. Any beach where the mullet schools get within casting range the tarpon, snook, jacks, sharks, ladyfish, bluefish, and spanish mackerel will be in the mix. 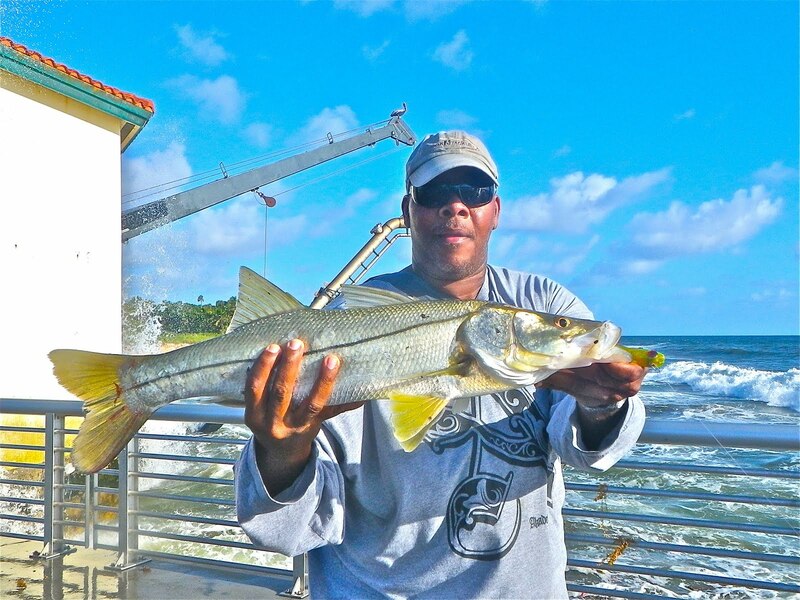 INSHORE: Snook season opened Friday...pretty much that all needs to be written! Snook fishing remains the best bet inshore right now. The bridges are holding fish at night, as are certain docks and seawalls in the Loxahatchee River and ICW. Look for the snook to be keyed in on bigger baits. The mullet aren't far away and the snook know it. Big baits like SpoolTek Swimbaits, Flair Hawk Jigs, and big swimming plugs are great bait choices to try and invite a slot size snook home for dinner. Look for the outgoing tide to produce best for the snook. Some big jacks also mixed in with the snook; as are a few tarpon. Other inshore action is a bit slow. It's all about the mullet showing up now; and when they do...GAME ON! Winds are blowing out of the South at 9 mph, gusting to 13 and there is a light chop on the water. Winds will shift to the Southeast this afternoon. There is a chance of scattered showers and thunderstorms after 3:00 p.m. today. The extended forecast for seas over the long weekend looks favorable for our boaters. Chances of showers and thunderstorms are good also, always check the marine forecast prior to boating. 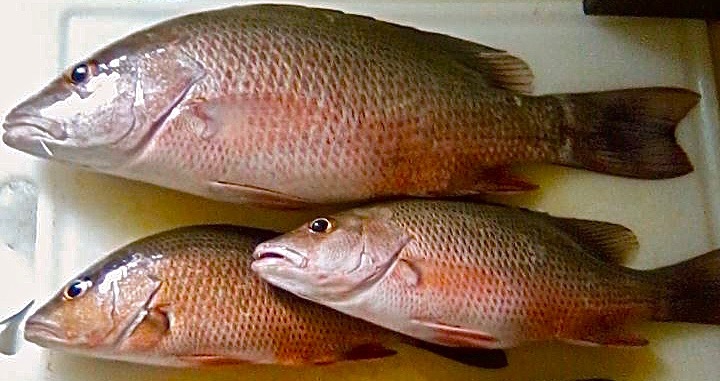 Mangrove Snapper have been biting sporadically; we received an update from Charlie Achinelli of Melbourne who said he landed his largest of this season, a 17" beauty on a greenie. A couple of nice Cuberas have come over the rails as well. Tommy Turowski of the Sebastian Inlet Bait and Tackle Shop reports a slow start to Snook season. He's not heard of anybody having luck so far, the Snook obviously got the word. He said several schools of big Reds have been spotted from the north jetty. A few nice Permit have been landed by anglers drifting small crabs from the north and south jetties. Our angler of the day is Matthew Hartfiel of Jacksonville. Matthew was here trying his luck and landed the real nice Cubera Snapper in our photo. Matthew reported a slow but steady morning and early afternoon. There were plenty of greenies in the water and some medium sized schools of mullet. A few anglers were using Sabiki rigs to land the greenies and one lucky angler landed a large Spanish Mackerel on one, others were catching Ladyfish and Jacks. Jacks were consistent through the day. A few C/R Snook came over the rails in the early morning. The highlight of the day was schools of Tarpon rolling off the end of the north jetty. At one point, he estimates 40 or more although they weren't hitting anything.